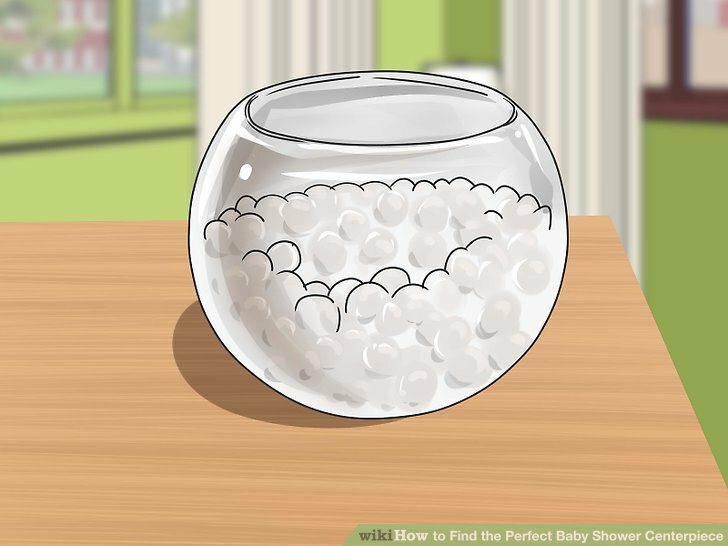 The centerpiece for a baby shower doesn’t have to be perfect, but it can be if you take a little time to find just the right one. Consider your options and be specific with what you want to make your search for the perfect centerpiece easy and effective. 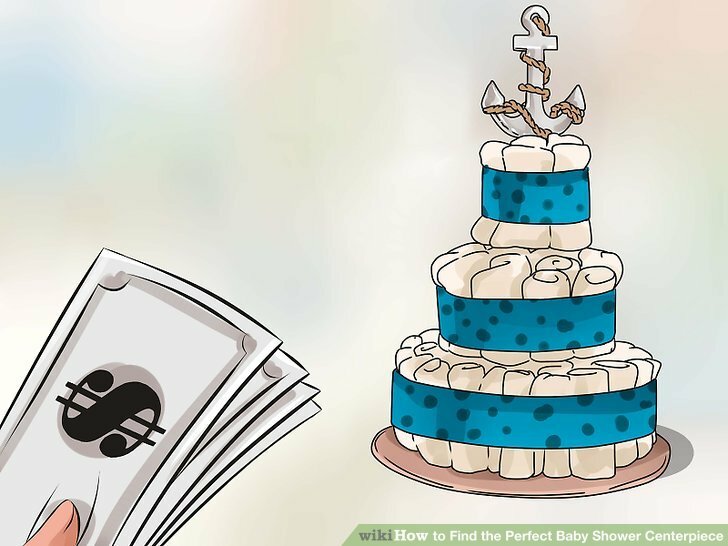 Figure out what you would like the theme of the baby shower to be. Choosing a theme will help you be specific about what you are looking for in decorations and help you to narrow your search for a centerpiece. Some sample themes for boys are: cowboys, sailors, robots, dragons, pirates, sports, and little mustaches. Themes for girls may include: butterflies, princess, flowers,and tea parties. Non-gendered themes could be: teddy bears, rubber duckies, story books, owls, birds in a nest, sweet peas, or puzzles. A “cake” made of diapers. A bouquet of flowers or balloons. Floating candles or rubber duckies. Building blocks and stuffed animals. Ask the parents for input. Ultimately, you want the centerpiece to appeal, and perhaps even be useful, to the parents-to-be. Consider what you already know about them, and ask them them questions about what they may want or need. If the parents have a more elegant taste, go with something which matches that style, like a fancy floral arrangement or a princess theme. For a young and fun couple, or a hipster style, choose something like the mustache theme, owls, or colorful bird cages for their new nesting baby! The new baby may bring some financial stress to the new parents. In this case, choose a centerpiece which is also practical and useful like a diaper cake, story books, or toys. Purchase or make your own centerpiece. 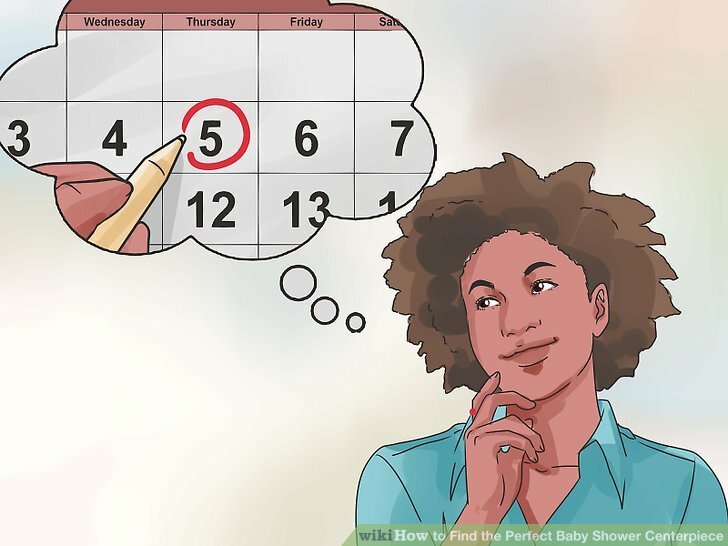 If you are able to find exactly what you need online, visit the store or order it online in time to arrive before the date of your baby shower. If your search gave you an idea you cannot find available online, or you would like to save some money and get creative, buy the items you need and put them together yourself. 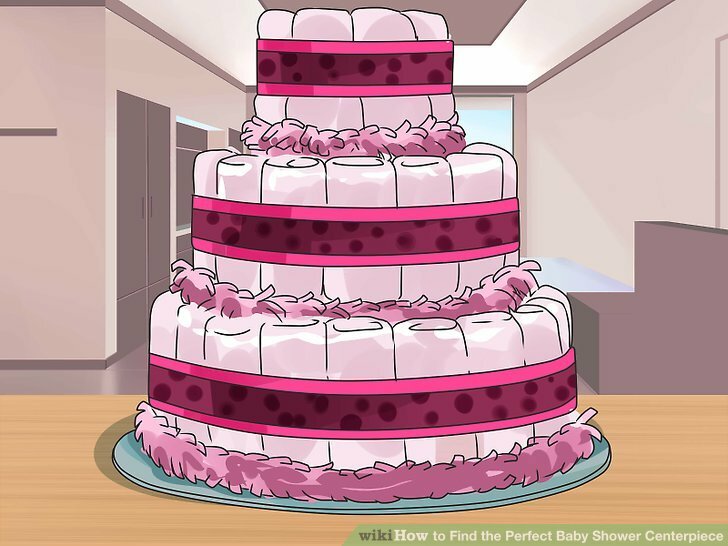 For instance, if you chose to make a useful and practical centerpiece, you can purchase a diaper cake online or make one yourself. You can even adorn the top of the “cake” with a stuffed animal or toy in line with your theme, as well as stacking items like bottles around each layer. Consider using baby washcloths as icing between layers. Your new parents will have both an attractive and useful centerpiece to take home with them. If you aren’t crafty, consider reaching out to a friend to who could make the centerpiece for you. Send them the items you collected and be sure to explain exactly what you want the finished product to look like. Cut a 14 inch circle out of a piece of cardboard. Attach a paper towel roll on it’s end to the center of the base using hot glue. Press the end of the roll firmly into the base, while making sure that the paper towel roll is perfectly perpendicular to the base. Allow this to dry into a sturdy support system while you prepare the first layer of diapers. Roll diapers and secure them with rubber bands. Start at the top, open edge of a disposable diaper and roll toward the bottom. Wrap a rubber band around the center of the roll to hold it in place. Repeat this process with six diapers. Cloth diapers can also be used. First fold them into a square, then roll them and secure them with rubber band. Create the inside layer of the first tier. Place the rolled diapers on end around the base of the paper towel roll. It should take about six diapers to surround the roll. Wrap curling ribbon around the six diapers. Cut off enough ribbon to easily tie a knot and secure the six diapers to the base of the paper towel roll. Tie a double knot in the curling ribbon for extra security. Cut away any excess curling ribbon to keep the look clean. You can choose to remove the rubber bands at this point, once the ribbon is in place. These rubber bands will be covered by the next layer of the first tier. If you would like for the rubber bands not to be visible, it is only necessary to remove the rubber bands from the outside layer of each tier. Add a second layer to the bottom tier. Roll 11 diapers from top edge to bottom and secure them with rubber bands. Stack these on end on the cardboard base around the outside of the six diapers which are already in place. Tie curling ribbon around this layer, tie it securely in a knot and cut away the extra ribbon. Complete the bottom layer of the diaper cake. Roll 17 diapers from top edge to bottom and secure them with rubber bands. Placing the edge of the roll on the cardboard base, wrap the second layer of the bottom tier with these diapers. Tie them in place with a curling ribbon. Remove the rubber bands from this layer to avoid having them visible in the finished product. Build the second tier of the diaper cake. Roll six diapers and wrap a rubber band around them to hold them in place. Using the first tier of diapers as a base, stand these six diapers on end around the paper towel roll. Secure them in place with curling ribbon. Repeat this process with 11 more diapers to create the outer layer of the second tier. If you choose to, you can remove the rubber bands from the outer layer after securing it with curling ribbon. Finish the tiers with a third layer. Roll six diapers and secure them with rubber bands, then stack them on the second tier around the top of the paper towel roll. Secure these diapers to the paper towel roll with curling ribbon, and remove the rubber bands. Add color to the tiers with decorative ribbons. Choose some decorative ribbon in your color scheme, theme or patters to adorn the diaper cake. Wrap each layer in colorful ribbon, Cut it to fit and secure the ends together with hot glue. You may choose to use two different ribbons on each layer. Choose one thicker and one thinner ribbon. Put the thicker ribbon in place first, then wrap the thinner ribbon around the center of the thicker one. This creates a layered look and can allow for more colors or patterns. Finish with a cake topper. You can top your cake with flowers, stuffed animals, or other useful objects like baby bottles, wash clothes, or a receiving blanket. 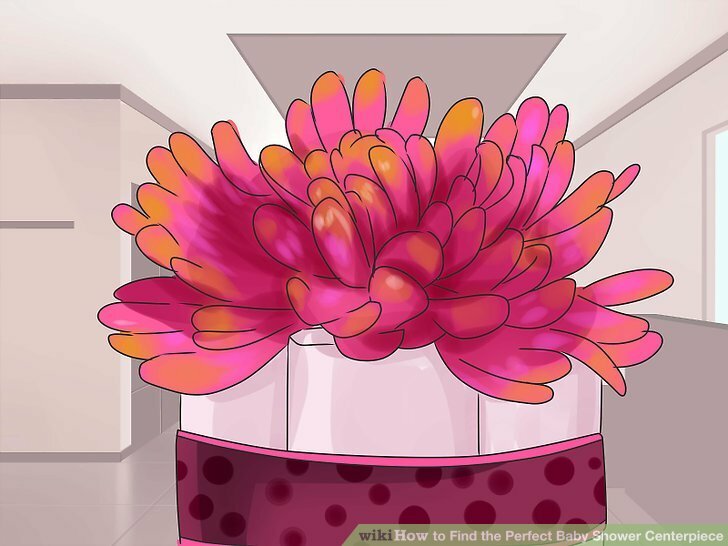 Flowers should match your color palette and can be placed in the hole of the top of the paper towel roll. 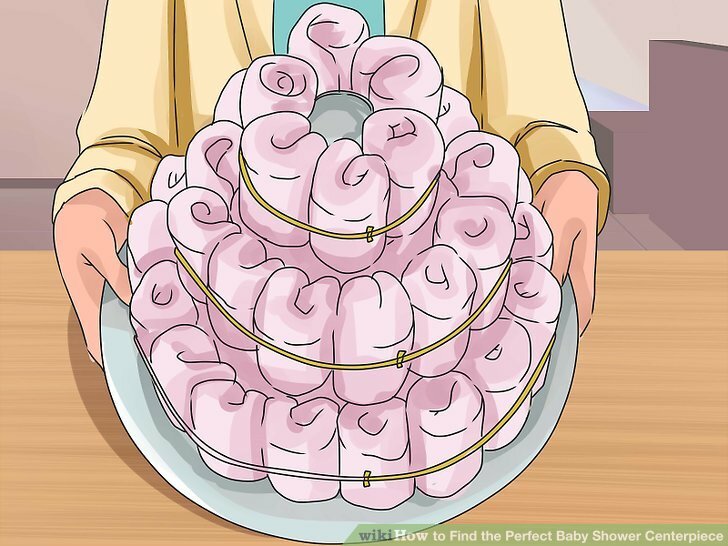 Blankets or wash clothes can be gathered in the center and pushed into the hole at the top of the paper towel roll to look like a flower or a burst from the top of the cake. Folded blankets or laid out washcloths can be used like icing on the top or between each layer. A stuffed animal matching your them could be placed on top of the top layer. 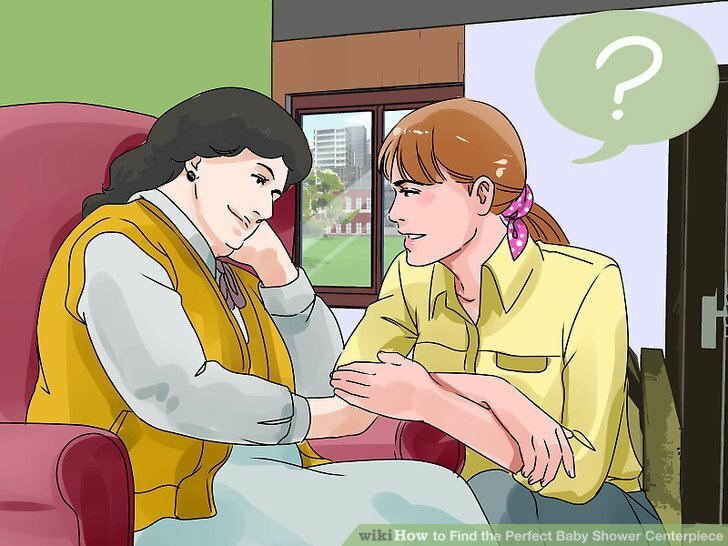 Choose a date for the baby shower. The season when the shower will be held will dictate some of what is available to you. This could effect the colors you would want to use as well as flowers which are in season. 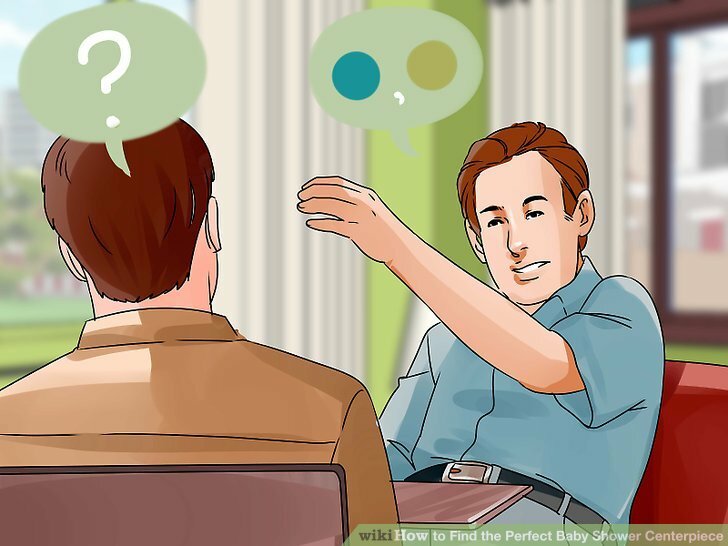 Consult with the parents to learn what colors they may already have in mind for decorating the baby’s room. Combine this with the season and the flowers which are available to you. For a winter shower consider using light colors like mint green, light blue, powder pink, or even all white. Winter flower choices include carnations and pansies. Spring calls for the bright warm colors like oranges and yellows. Flower options could include amaryllis, peony and cherry blossom. Fall has muted versions of these warm colors like an olive green or mustard. Some fall flowers are mums and gerber daisies. Select a vessel for the arrangement. You can choose to use a cute vase, or opt to combine a vase with something creative which will match your theme. Consider placing a vase inside a much larger jar and filling the surrounding space with small objects in line with your theme. Some examples could be toy dinosaurs, peas, plastic letters, and colorful cereal. You could also place a vase inside a bird cage which is slightly larger than the vase. You can spray paint the vase to match your color palette, then thread the flowers through the holes of the cage and into the vase inside. Wrap a plain vase in the pages of picture books. Arrange your flowers in the vase. You may choose to arrange the flowers yourself or have a professional do this for you. If you choose to have a florist make the arrangement for you, take your color palette and vase or base combination to the flower shop, so that you can explain exactly what your vision is for the centerpiece. To arrange the flowers yourself, work in layers. Create a base, support layer with leafy green stems or dense flowers like baby’s breath. Trim these stems about half an inch from where they create a “v”, then criss cross them from the corners or edges of your base to create a good support base for the rest of the arrangement. 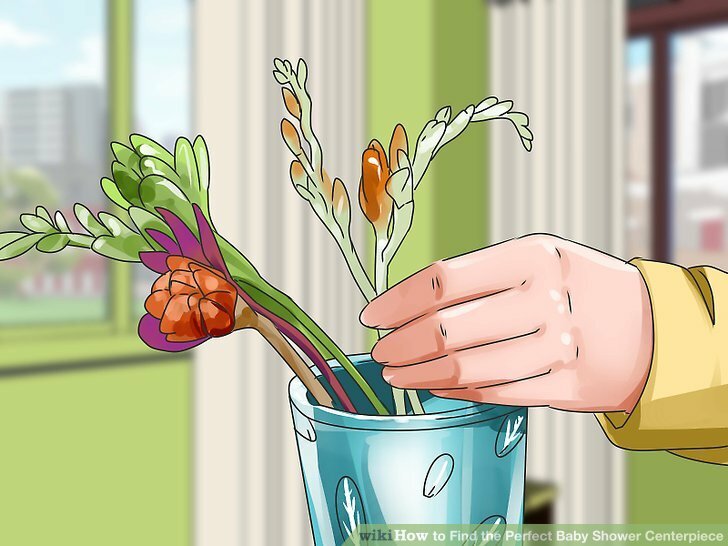 Remove the bottom leaves to avoid molding the leaves and rotting the water. Trim the flowers as you go to fit the your height preference. Start with your largest blooms, then add different types of flowers with progressively smaller blooms. Add odd numbers of each type of flower until your arrangement looks complete.